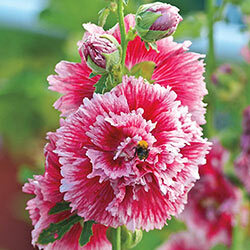 To create a dynamic and interesting border or privacy screen, try adding Fiesta Time Hollyhock. This statuesque variety is perfect for planting at the back of a mixed border, along a sunny fenceline or wall. Fully double blooms of bright cerise-pink grow along slender, 4-6' stems. Staking these stately flower stalks is recommended in areas exposed to wind and rain. This will keep the blooms upright and visible throughout the growing season. Cut a few stems to create gorgeous fresh floral arrangements suitable for enjoying indoors or giving as gifts. These intriguing flowers add color, style and vertical interest from midsummer to early fall. Hollyhocks are best treated as biennial or short-lived perennials. They thrive beautifully under Black Walnut trees. Bloom Time mid summer to early fall. 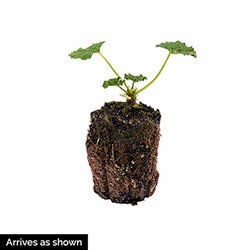 Foliage Type: 3-7 lobed, large rounded, rough mid green leaves. Bloom Time: mid summer to early fall. Flower Form: Dense, double flowers borne on long terminal racemes. Planting Instructions: Good for growing along a sunny wall. May require staking in exposed sites. Pruning: Cut back for increased flowering later in the summer. Winter Care: Mulch to protect roots from frost heave. Additional Information: May need staking if planted in windy conditions. For cutflower use - cut when 2/3 open for longer vase life.